That fundamental analyst, stock chart technician, or behavioral analyst will likely lose you money. There are legions of websites, blogs, newsletters and firms peddling advice on how to trade or invest better in the stock market. They are driven by fundamental analysts, stock chart technicians, behavioral analysts and a variety of others who routinely look to the past, or build models of the future, on which basis they profess some insight on the probability that their chosen investment will either go up or down. They are hard to find, but some firms are quite logical, deliver grounded analysis and are worthy of paying attention to. Yet another group sound like astrologists, not making sense, or making promises that are too good to be true. These are the easy ones to avoid. The most difficult group are those that sound quite informed and use rational analysis yet reached flawed conclusions. This latter group will make you lose money, if you confidently follow their approach or advice. This analyst, the author of the blog shown above, has identified that this year, the day before Thanksgiving was a losing day. He then conducts an analysis to to see when that happened historically and what the market did on the following trading day. He finds 10 occasions where the day before Thanksgiving was lower, and 3 of those 10 times, the following day the market was also lower, while 7 of the 10 times, the following day the market was higher. One would surmise therefore that there is a bullish bias that this next day upcoming should also be up. After all, 7 of the 10 times when this happened in the past, the market was up the following day. He also indicates that fridays after Thanksgiving historically, not just the ones that follow a down day, have been bullish. Moreover, he circles the two instance where the day before Thanksgiving was lower by more than 1% (which occurred this year), and those suggest that the following day could be very good winners. The analysis shows that on average, the down days were down by 0.64%, while the up days gained 0.81%. And because there were more up days than down days, the average of all the occurrences was a positive 0.35%. This 0.35% positive return is a good tradable return from a statistical expectancy point of view. But is that the right way to look at this data? I think not! Let me use an analogy to explore the concept. Suppose you were in the business of flipping coins (the market going up or down each day is equivalent to flipping a coin since it rarely stays the same, which would be equivalent to a coin landing on the edge). And suppose I told you that on reviewing your previous pattern of coin flips, we found there were 10 days on which you had flipped 5 consecutive heads. Further that when we reviewed what happened afterwards that 7 of the 10 times after you had flipped 5 consecutive heads, on the following coin flip you also got heads, while only 3 were tails. Now we have just gone five days in a row where you have flipped 5 heads. Would you bet $2.00 to win $1.00 that the next flip is a heads? How about $1.25 to win $1.00? 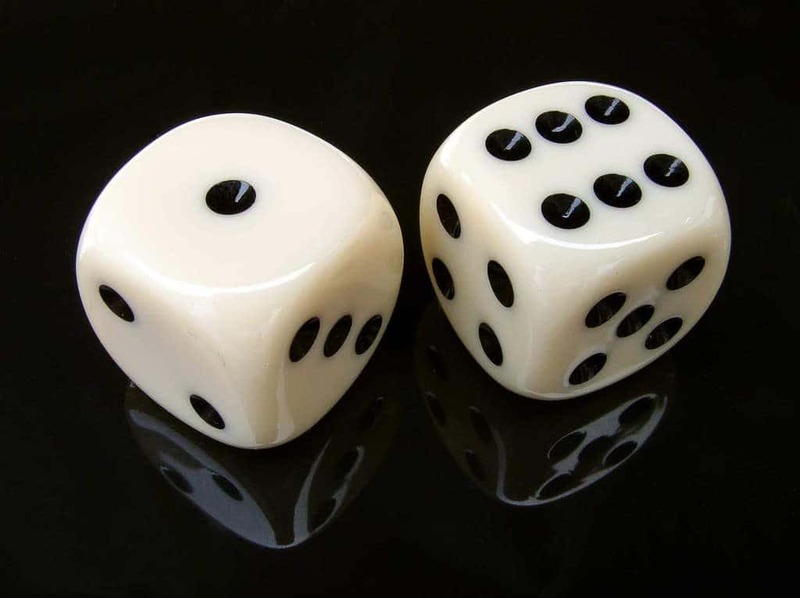 The pattern analysis suggests you should, if you think there is a 70% chance of winning $1.00 (flipping a head) while there is a 30% chance of losing $2.00. And if you are using that reasoning, then you should be much more amenable to the $1.25 bet. But my guess is that you probably won’t take either bet. The instinctive answer is correct, even though the rationale many people give may not be. Most people, who did not pay attention to the statistics classes, say that after they have seen a streak of five heads that it is more likely that they will see a tails. Some might even be inclined to bet $1.25 to win $1.00 that the next flip is a tails. There is some real cognitive dissonance going on here, and it goes to show why people looking at statistical data or patterns might be misled. The essence of the problem is in figuring out the likelihood of your next flip being heads, or the market going up. And the simple answer is that it is equally likely that the next coin flip will be a heads or a tails (unless of course the coin is weighted on one side more than the other). Similarly, the market is equally likely to go up the next session, as it is to go down. So what is the likelihood that the market would be up on the day after thanksgiving when it was down the day before? 50%! And what happens to this fine analysis when we look at the expected results based on those probabilities? We know that on average it was down .64% on the losing days and up .81% on the winning days. Therefore, one might surmise that, on average, there is a 50% chance we could be up .81%, and a 50% chance we might be down .64%. The resulting expectancy is .08% up. This is an expectancy so negligible, it might not even pay for the commissions, and certainly cannot be traded. But that chart above, and the accompanying analysis, was very compelling with many positives and so few negatives. Just as compelling as those five heads in a row pattern should have been to you. Analysis of the past make you more or less confident about rolling a heads next time, when they should not. If the market goes up today, it will be by random chance and rarely will it have anything to do with what happened yesterday or two days ago! Beware of the analyst who does not understand statistics and the facts, they can be hazardous to your wealth. 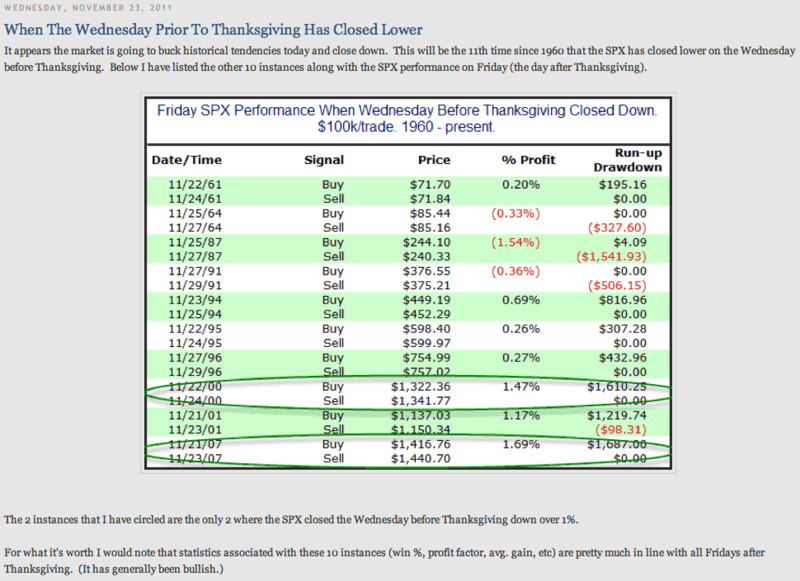 On the Friday following Thanksgiving the SPX opened at 1161.41, and closed at 1158.66, slightly down. Goes to show that historical data mining to find statistics that show a preponderance for going up has nothing to do with what the market will do in the future! Previous Post:Why Was The New iPhone Delayed?Next Post:Why I Love This Time of New Year!